My goals: I haven’t set any in particular, but last month I got a little irritable with myself about how I looked in a bathing suit this past summer, so I decided to commit November and December to getting back into the gym more regularly and keeping a keener eye on what I’m eating. If I lose a few pounds during this, great — but the numbers on the scale don’t bother me nearly as much as being constantly tired and “less than tone” in my midsection. I was super hungry at 2:30 p.m. so I went for my third bottle of the day at 3 p.m. – “lift”, made from carrot, water, beet, apple, lemon, ginger. It’s got a bit of bite to it from the ginger, and that’s awesome. I’m wearing a white shirt today, so I’m drinking very, very carefully. I definitely still feel “hungry” though. For scientific reporting purposes, I weighed in at the gym at 115.4. We’ll see if that fluctuates at all during this three-day cleanse. When I got home from yoga, the headache was gone and I did two more juices before crawling into bed to write this recap – the “glow” and the only “calm” of the day, which was distinctly different because it’s made from cashews, maple syrup, vanilla and cinnamon. It definitely has a “milky texture”, but is dairy free. Not a bad end to the day, but certainly a departure from the five previous juices. I also don’t feel hungry at this point! Good night, y’all – can’t wait to see how I feel on day two. 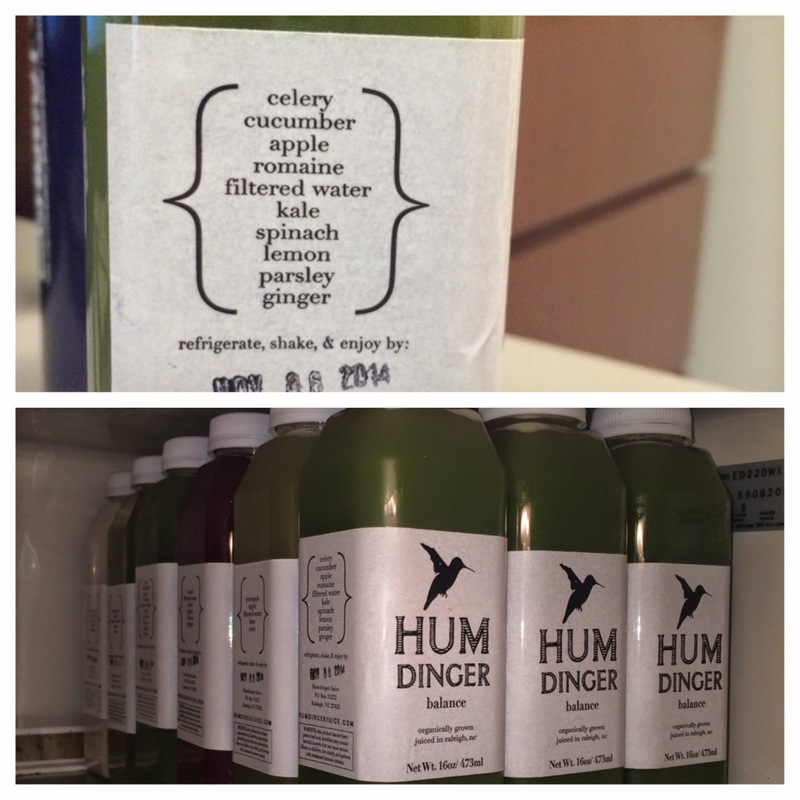 Day 2: I’m on my first juice of the day – a little behind schedule, but not feeling super hungry, either. 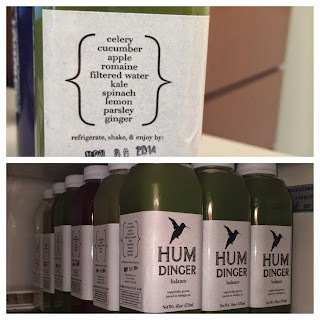 I’m repeating the schedule of juices (Balance – Glow – Lift – Balance – Glow – Calm) for the entire three-day cleanse, so I’m going to try to get the Glow in during the 11 a.m. hour and the Lift around 12:30 p.m. or 1 p.m. as Colin from Humdinger suggested having about one every hour and half. Those headaches are a result of toxins escaping. Keep it up! It gets easier each day. Promise. Drink plenty of water as well. That helps with hunger. You could also have an herbal tea in the afternoon. Just make sure it’s caffeine free. Today was tough. I ended up having a rush project on my desk I wasn’t expecting and was late getting to my third and fourth juices of the day because I worked straight through without thinking of lunch (happens too often! ), but got them in while I was running around before the event I was setting up and staffing from 4 pm until 9 pm. Speaking of which… it was torture being at the Red and White Food and Beverage Festival and not sampling everything in site. I cannot believe I had the will power to hold out, while being super hungry, until I could get home to my last two juices. And before I got home I stopped by the Y to weigh in on the same scale as last night: 113.8 pounds. I’ve got my “calm” juice left to go tonight and then I’m hitting the sack early (for me) so I can hit the ground running earlier than normal tomorrow. Last day is in sight. I’ll update more as the three-day experiment continues… stay tuned! I’ve made it to my last two bottles of juice. Today was another busy day, so I wasn’t totally on a three hour schedule – but not too bad. I weighed in at the Y again tonight before yoga… down to 111.6 pounds. That’s almost 4 pounds down in three days. Like I said earlier, the number doesn’t really both me. I haven’t noticed too much difference in my stomach, but I also didn’t expect to shed any excess fat during a three-day juice cleanse. I am hoping to use the discipline of the last three days to jump start my commitment to eating better and exercising several times a week. So far, so good. It’s been a commitment, and I made it. No stopping here, right? Day 4: The first day after the cleanse! I woke up and felt the same as I had most other days, but within an hour of starting my day, I was hungry and craving a juice. I had a busy morning and the first meal I had was at lunch around 12:30. I could tell an immense difference in the way I felt after having tomato and avocado sandwich with sauteed spinach at a restaurant. I likened it to what people with gluten sensitivities must feel like. I think I should have started lighter with a simple salad and eased back into things! At dinner, I had a grilled asparagus and grilled mushroom salad. I asked for dressing on the side, but it came way over-dressed and I dreaded sending it back, so I only ate about half of it. The one glass of wine I had, though? Woah, Nelly! I had a buzz. Probably should have not splurged with that. Things I’ll know for next time. Day 5 Summary: With all of yesterday’s experiences, I’m definitely going light and easy and heavy emphasis on vegetables and fresh fruit through this weekend to ease back into the life of eating solid foods again. I can absolutely see myself swapping out bottles of juice here and there for meal replacements, but I hope to stay on my path of healthy eating and regular exercise for the next few months until I’ve saved up for another cleanse for pre-summer bikini goals. I do feel like a healthier person for having done it and I’m absolutely more conscious of what I’m putting in my body. Cheers, y’all! If you have any questions about my cleanse, feel free to leave comments below or email me at lisa.jeffries@gmail.com privately. Disclosure: Humdinger did not compensate me in any way for this post, but I do sincerely appreciate their donation to the Rex Gala, where Johnnie Bud bid on and won this item!